“The Muslims and Copts are one hand” was one slogan that could be heard ringing out across Tahrir Square throughout the Egyptian revolution. More than two years later, a mob of Egyptian Muslims doused Copt Saber Helal with gasoline and set him on fire in a town north of Cairo. How times change—or not. In reality, the Tahrir Square unity was the aberration, not last week’s sectarian violence. Egypt’s Coptic community—comprising approximately ten percent of the overall population—have a long history of persecution, predating even the Islamic era to when Egypt was ruled by the Roman and Byzantine empires. If we look at the period from the birth of the republic until the January 25 Revolution, it is clear that relations between Egypt’s Coptic and Muslim communities have steadily declined. Periodic sectarian riots and mob attacks flared up throughout the period, resulting in hundreds of Copts being killed and thousands more injured. There have also been mass burnings of Coptic-owned homes, businesses and churches. More recently, there have been a number of deadly massacres and terrorist attacks, including the Kosheh massacres, the Nag Hammadi massacre and the Al-Qiddissin Church bombing. In light of this recent history, last week’s sectarian unrest is nothing out of the ordinary, although it did mark a sharp rise in sectarian violence. Muslims and Christians clashed in the town of Khosous, leaving four Copts and one Muslim dead. The following day, clashes broke out again after Copts held a funeral mass for the victims at Cairo’s Saint Mark’s Cathedral. Mourners were reportedly attacked and forced to take shelter in the cathedral for hours as local residents—and according to some reports security forces—laid siege to the building. 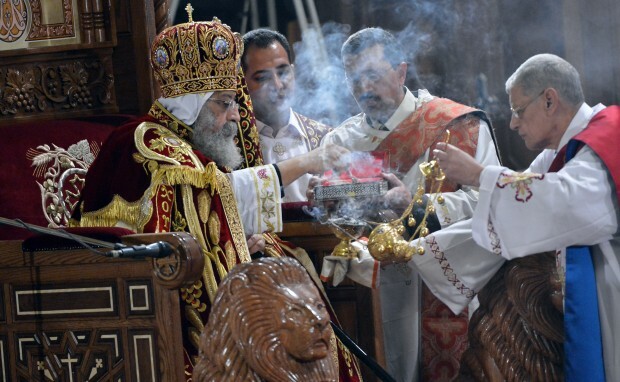 Saint Mark’s Cathedral holds a special place in the hearts of Egypt’s Copts. Not only is it the seat of the Coptic pope, but the new cathedral’s inauguration in 1968 was attended by President Nasser himself. The president used the occasion to emphasize that he was president of all Egyptians, regardless of creed. These are familiar words, but ones that did not ring hollow at the time, as evidenced by the president’s close relationship with Pope Kyrillos VI as well as the president’s pan-Arab, rather than Islamist, rhetoric. In the eyes of many, Copts and Muslims alike, Saint Mark’s Cathedral is a symbol of Egyptian tolerance and identity. Last week’s siege is the first time that the cathedral has ever come under attack, setting a troubling precedent. Relations between Muslims and Copts settled into a relative normality during the Mubarak era, although this period was also punctuated by attacks on the Copts. The last such incident was the deadly Al-Qiddissin Church bombing in Alexandria in the month leading up to Mubarak’s ouster. It is also important to note that the former dictator deliberately isolated Copts from the state by leaving the Church largely to its own devices and excluding Copts from roles in state institutions. Nonetheless, Copts are now viewing Mubarak’s rule through rose-tinted glasses, harking back to the ‘good old days’ before the chaos of the post-revolutionary era. Pre-revolution, the situation was far from perfect—but at least they were relatively safe. Following the revolution, we have seen the demolition of a church in Upper Egypt and the ensuing Maspero demonstration that resulted in bloody clashes between Egypt’s Copts and the army, something that would have been unthinkable in Mubarak’s day. More recently, the new pope, Tawadros II, took to the media to directly criticize President Mursi’s response to the recent sectarian violence, accusing the president of “negligence” for failing to protect Saint Mark’s Cathedral. This week, an Egyptian police officer was sentenced to fifteen years’ imprisonment for torturing to death a Salafist who was forced to confess to taking part in the 2011 Al-Qiddissin Church bombing. The politicized nature of sectarianism in Egypt is becoming increasingly evident. Today, we hear accusation and counter-accusation swapped between the Muslim Brotherhood-run government and civil society as to who is responsible for the sectarian unrest. The Egyptian judiciary even opened a probe into former interior minister Habib El-Adly’s alleged involvement in the Al-Qiddissin Church bombing. Alexandria’s Al-Qiddissin Church bombing serves as an important lesson for all Egyptians. The deadly sectarian attack that killed more than twenty worshippers also showered the nearby Sharq Al-Madina Mosque in debris and blood. The lesson for Egypt’s Muslims and Copts is simple: you cannot harm each other without harming yourselves, and by extension Egypt.